EVER SINCE Britain voted 52% to 48% in 2016 to sever ties with the EU, the country has been split between “Leavers” and “Remainers”. Nearly three years after that referendum Theresa May, the embattled prime minister, has negotiated what she considers to be the “best possible deal” for Britain. Her hope was that the plan would unite the country. It has done, but not in the way she would have wished. Not only was it comprehensively thrown out by MPs at Westminster in January, it appears to have united the public in opposition, too. YouGov, a pollster, asked 90,000 British adults late last year what they thought about Brexit. As our print article this week explains, The Economist built a demographic model using these data to calculate an individual’s probable attitude to each of three possible Brexit options: no deal, Mrs May’s deal or remaining in the EU. Unsurprisingly, the younger, wealthier and more educated an individual is, the more likely he or she is to want to remain in the EU. Disentangling the preferences of Leavers is harder. We found that male political junkies are most likely to support “no deal”; women who are indifferent to day-to-day political machinations are more supportive of Mrs May’s agreement. In the graphic above we have produced a sample of 2,500 individual profiles, which together represent approximately one quarter of the British electorate. 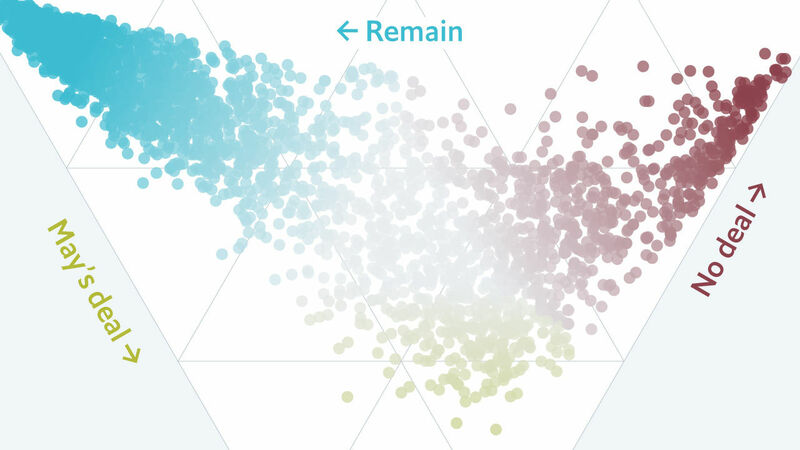 The likelihood that an individual who fits each profile will support one of the three Brexit options is displayed in the triangular scatter plot. Mrs May’s deal is clearly the least popular of all three options. Click the dropdown boxes to see how different variables affect the probability that British voters will hold a particular view on Brexit, and to see what our model says about you.